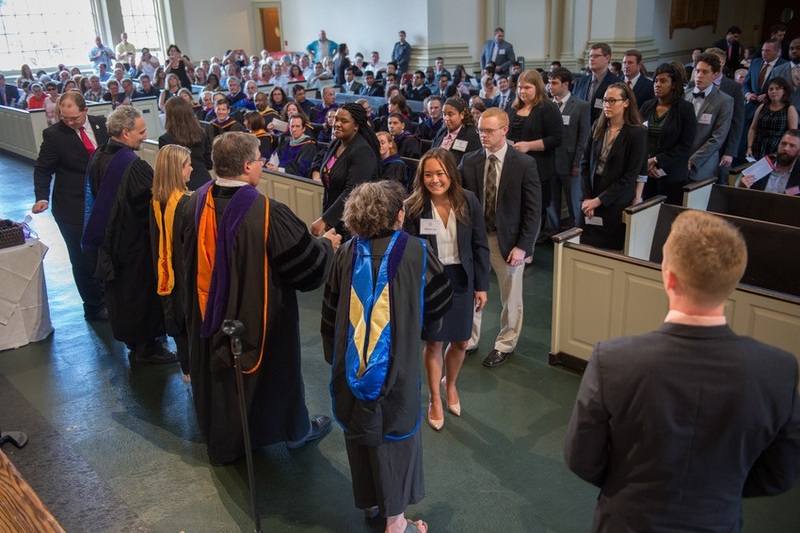 New College of Law students are welcomed Tuesday during the opening Convocation in Hendricks Chapel. The College of Law welcomes its incoming J.D. Class of 2018 and LL.M. Class of 2016 this week with a full schedule of orientation events and programs. The events and activities are being hosted by the college’s faculty, staff, alumni and returning students to give the next class the insight and information they need while bringing them in to the College of Law family. The College’s 119th J.D. class of 189 students is almost evenly split between male and female (51 percent to 49 percent) coming from 30 states and five countries. Students of color comprise 28 percent of the class. In addition, the class represents 117 different undergraduate institutions with 7 percent holding advanced degrees. The LL.M. program, now in its fourth year, features 33 students (nearly double the size of last year’s entering class) from the legal education systems of 14 different countries and regions: Azerbaijan, Brazil, Colombia, Ethiopia, Haiti, Kenya, Nicaragua, Palestine, Peru, Saudi Arabia, South Sudan, South Korea, Spain and Syria. 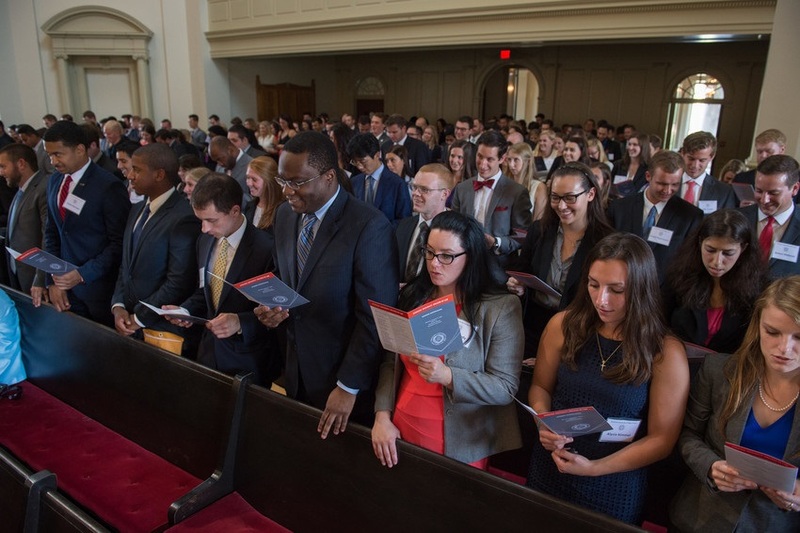 New College of Law students participate in Tuesday’s Convocation in Hendricks Chapel. “The incoming J.D. class is a diverse, highly regarded group that has already experienced significant accomplishments in their undergraduate and graduate programs. Our LL.M. program has grown significantly in its four years, with the incoming class being the most geographically and professionally diverse to attend the College of Law yet,” says Nikki Laubenstein, director of admissions for the College of Law. The week of seminars, alumni and student mentor networking events, and team-building exercise culminates with a community service activity where the students, faculty and staff will visit a local farm to assist with the harvest of produce for distribution to local food banks.